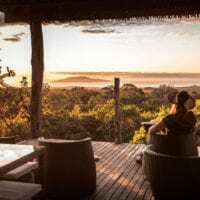 How to be a responsible traveller? 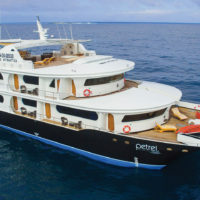 The best way to see the Galapagos Islands is on board the luxury cruise Petrel. 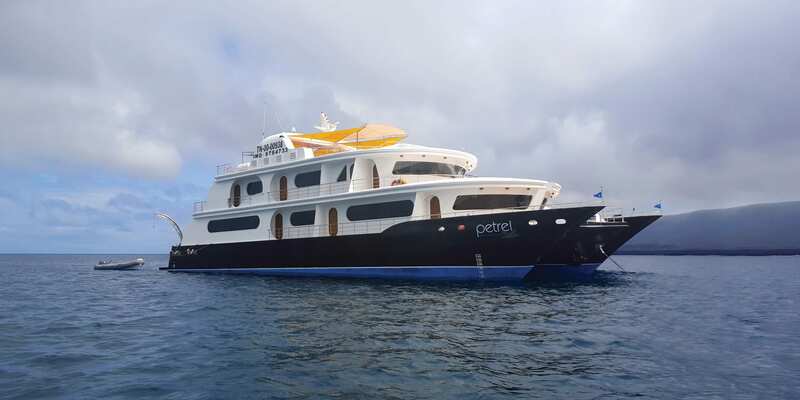 The newest ship in Galapagos, the Petrel offers a deluxe way to visit these magical islands. Named after a sea bird common to Galapagos, the Petrel is like its namesake: elegant, swift, and silent at sea. 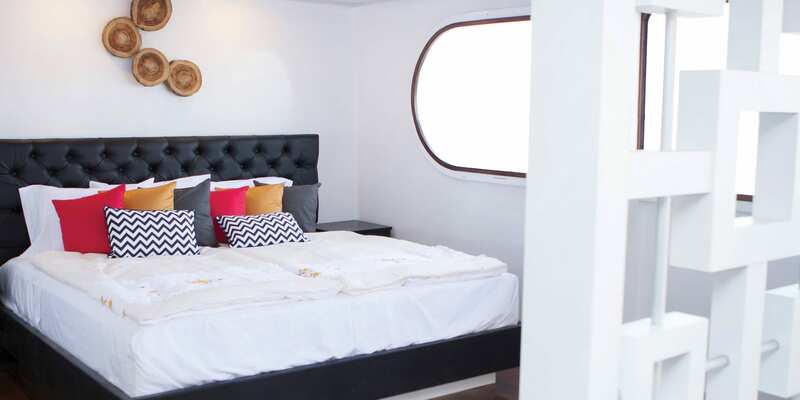 A motorized catamaran, the Petrel is designed for comfort and stability and is outfitted with spacious cabins, a comfortable lounge, and Jacuzzi. 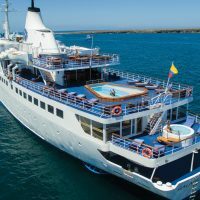 The best way to see the Galapagos Islands is on board a luxury cruise. 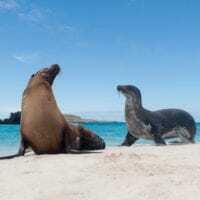 An opportunity to see Penguins as well as Marine Iguanas, Sally Lightfoot crabs and Sea Lions. Urbina’s Bay waters are a good place to see turtles and rays. Ashore you’ll find a short trail leading to a coral reef. 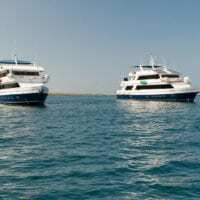 Enjoy swimming with Sea Lions, observing Blue-footed Boobies or Frigates nesting areas. 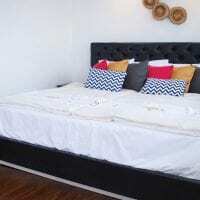 Relax at the beautiful beaches that Galapagos offer. Magnificent long white sandy beaches. 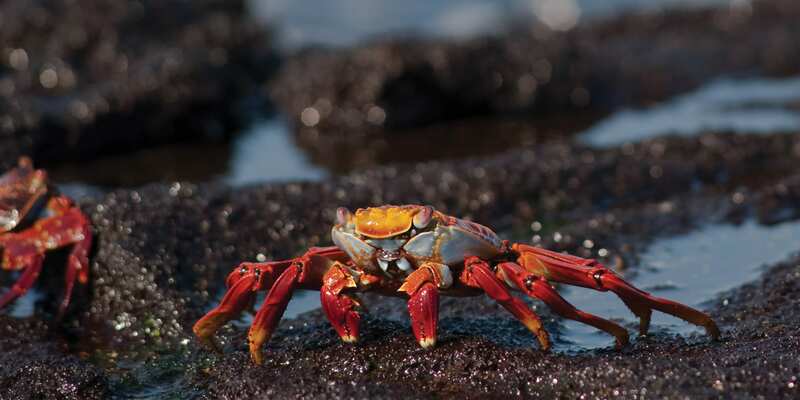 Very early this morning you will be transferred to the airport for your flight to Galapagos. 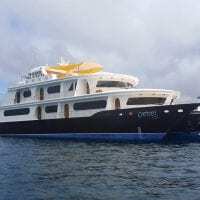 Your Galapagos Cruise include: Accommodation in selected cabin, all meals, Island sightseeing, Naturalist guides and lecture services in English, snorkelling gear, medical care on board (not including the cost of medication), shared transfers in the islands and from main hotels in Quito and Guayaquil. Please remember that the exact route and programme may vary according to weather and ocean conditions and the wildlife we encounter. 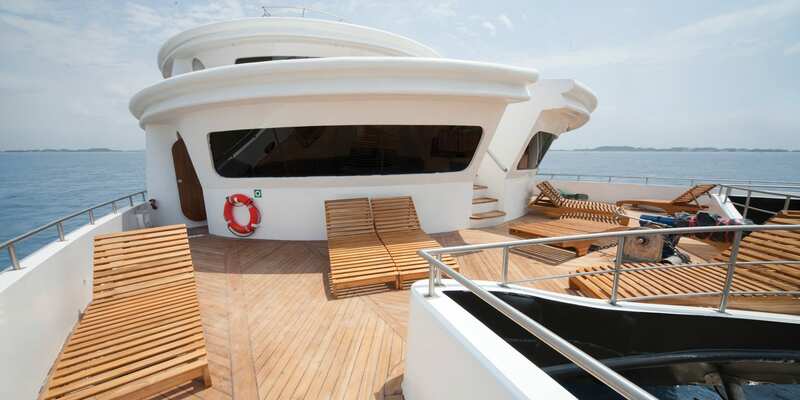 Dry landing: guests step from the dinghy onto rocks or a dock. Wet landing: as the dinghy edges onto a sandy beach, guests step into knee-deep water and wade ashore. 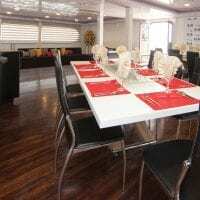 On arrival, you will be picked up at the airport by your naturalist guides and taken on a ten minute bus drive to the pier to board the Petrel where you will have lunch. The island was named after English nobleman Lord Hugh Seymour. 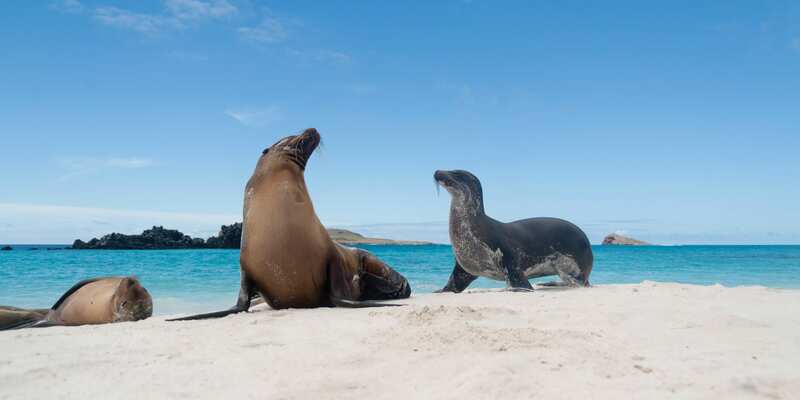 Formed by uplifted submarine lava, the island is home to a huge colony of about 2,500 Land Iguanas and large populations of Sea Lions, Blue-footed Boobies, Common Noddies and Frigate birds. Along the coast it is possible to see land and marine iguanas and the biggest colony of Magnificent Frigate birds. This is the largest of all the Galapagos Islands, about 120 km long, and is peculiarly shaped like a Seahorse! It is one of the few islands that are populated. The last census that was taken estimated about 2,200 people living on the Southern part of the Island. The island was formed by 6 different shield volcanoes from North to South that erupted continuously, eventually joining together to form on entire land mass. Of all the islands in the archipelago, Isabela is the most active with the latest eruption coming from Wolf Volcano in May of 2015. There are lots of unique wildlife on Isabela such as the Pink Iguana, and more wild Tortoises than any other island with a different type of species near each of the 6 volcanoes. On Vicente Roca Point the geological formations are simply outstanding and it is a great place to view various bird species such as Blue-footed Boobies, Nazca Boobies, Gulls, and Storm Petrels. 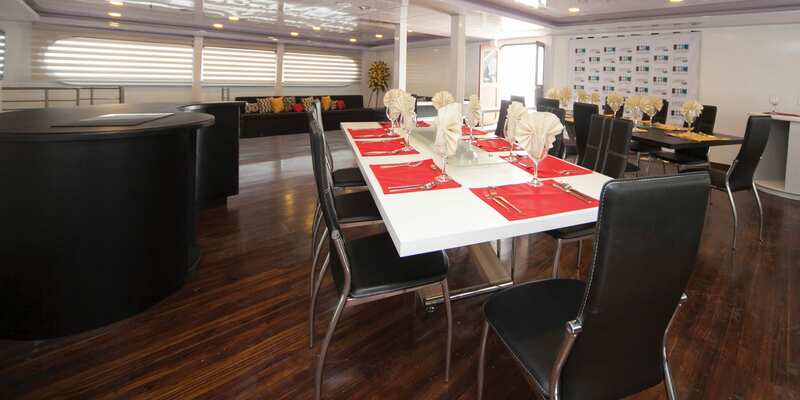 Activities here are all done on the water by either dinghy or panga, or snorkelling. On this western part of the island the Cromwell Current provides cold water and many nutrients. 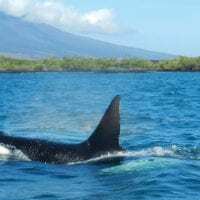 Due to this it is possible to see various feeding frenzies of an assortment of animals such as Whales, Dolphins, Sea Lions, and marine birds diving. At times, it may also be likely to see Fur Seals. 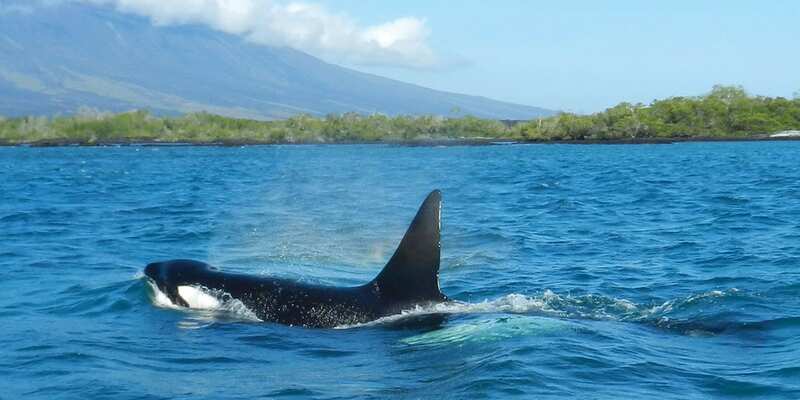 PM: Fernandina Island/Espinosa Point: No foreign species have ever invaded Fernandina Island and therefore it is one of the world’s most pristine island ecosystems. It is one of the most active islands and is the westernmost island in the archipelago. The volcano “La Cumbre” dominates the landscape with lava fields reaching the ocean. The Cromwell Current also flows on the west making the cold and nutrient rich water an ideal habitat for the Galapagos Penguin and Flightless Cormorant that nests here. Espinosa Point also provides a great opportunity to see the Galapagos Hawk. Land Iguanas are found on the inner parts of the island near the volcanoes caldera and Marine Iguanas will nest on the coast during certain times of the year. There is only one visitor site to Fernandina which may involve a hike or snorkelling opportunity, making the rest of the island unspoiled in a most natural state. This visitor site is located on the upper west part of the island and was named after and English war ship that used to pass the islands in the 1800’s. This was a famous spot for many pirates and sailors who have even left their names and the names of the ship inscribed on volcanic rock. 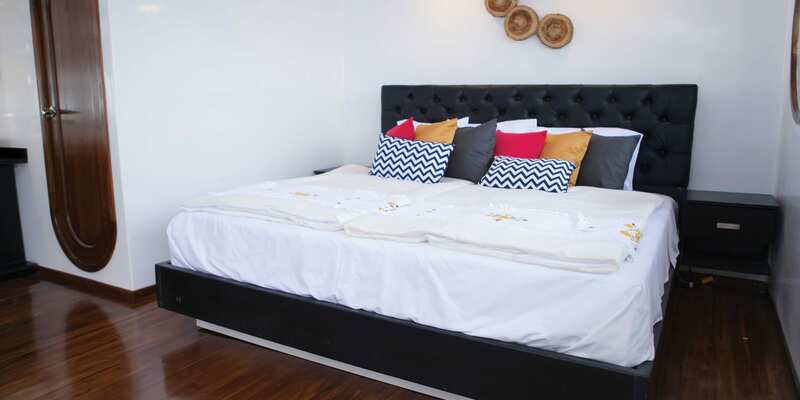 There are many different characteristics of the island here from various volcanic activities such as large volcanic rocks or small little balls of petrified rain. On the hike the path leads to Darwin Lake with a tuff cone. A bit more south of Tagus Cove is Urbina Bay. Urbina Bay is an interesting site due to the uplifts of the island caused by volcanic and tectonic activity. When it rose, so did the corals and reefs that were under the surface. You can still see them although they are beginning to deteriorate due to air exposure. 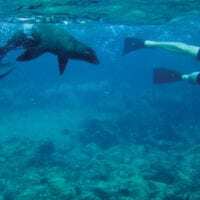 There are chances of seeing Giant Tortoises, Land Iguanas, and more Flightless Cormorants near the coast. Elizabeth Bay is located on the east coast of Isabela Island. The bay contains many islets, which can be visited by dinghy. Penguins and Blue-footed Boobies can be spotted on the rocky islets. 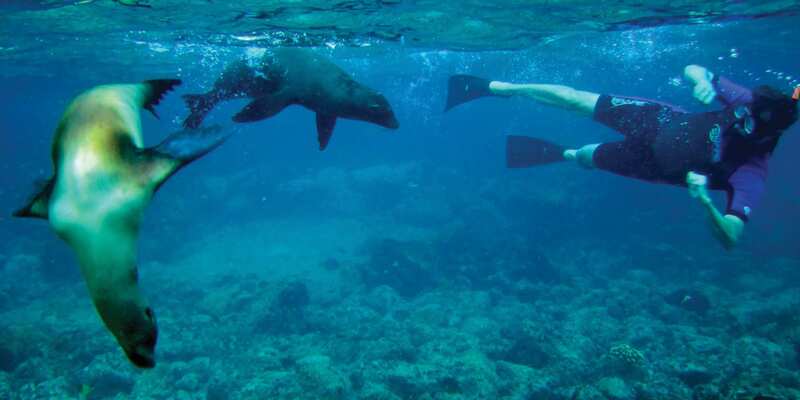 With an abundance of marine life and clear water, the area is perfect for snorkelling and viewing schools of colourful fish, Sea Lions, and perhaps even Sharks. Moreno Point is located near Elizabeth Bay on the west coast of Isabela Island. The plethora of birds seen during a dinghy ride along the striking rocky shores or a hike along path through lava rock leading to tide pools and mangroves create a birdwatcher’s delight. In the tide pools, Green Sea Turtles or White-tip Sharks can be spotted. These two volcanoes are located on the South of the Island and are two of the oldest of all Isabela’s volcanoes. A hike will show different types of vegetation and geological zones and possibly inside the caldera where petrified lava is present. Volcano Chico is easier to reach and recent lava flows from the 70’s can even be walked on. The wall of tears is an interesting visitor site where mangroves and a white sand beach are passed on the way. The “wall” was built by previous prisoners kept on the island as a cruel way to keep them busy. The wall is about 3 meters wide, 100 meters long, and 5-6 meters high. The Wetlands are comprised of lagoons, swamps, and various mangroves that are home to unique bird species. 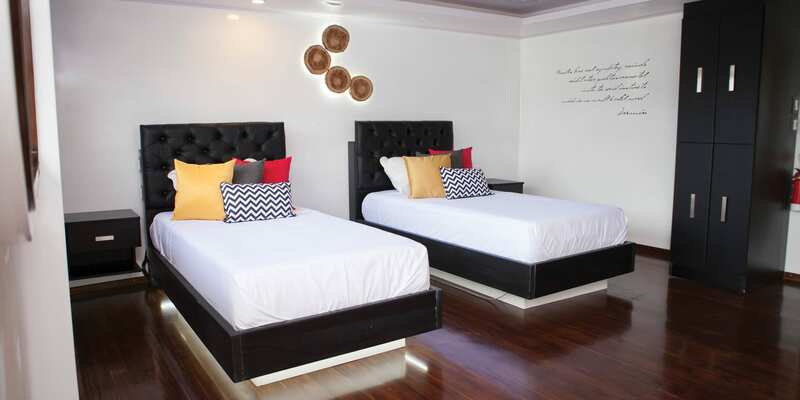 Today Santa Cruz is one of the most popular tourist sites. 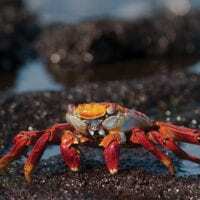 With a population of about 12,000 Galapagos natives, it has the longest paved road in the entire archipelago. One of the biggest conservation efforts is to eliminate all non-native plants and animals that are destroying native and endemic species on the island. There is no longer any volcanic activity but that does not mean there is no evidence. 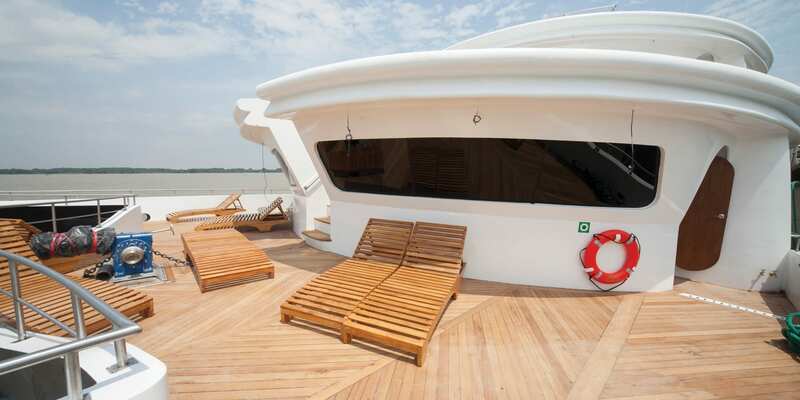 Santa Cruz means holy cross, but it’s English name comes from the British vessel – Indefatigable. 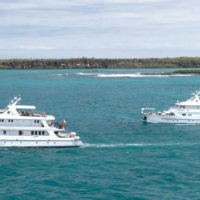 The station conducts many different research projects and provides assistance to other researchers and governmental institutions and agencies, especially the Galapagos National Park. Many of the results are later published online, in magazines, and popular scientific journals. The research station also plays a big part in educating the community and public schools in Galapagos. There is also the long time running Giant Tortoise restoration program that includes various stages of the giant tortoise from eggs, hatchlings, and adults. The Twin Craters or Gemelos, meaning twins in Spanish, are two caved in magma chambers of a previous volcano. After years of erosion and extinction, the once full chambers caved in leaving two similar craters that can be seen on a short hike that passes by a Scalesia forest. Santa Fe Island is home to the unique Santa Fe land iguana and is the only place to find Opuntia cactus. Giant Tortoises were once native to this island but after the many years of pirates and buccaneers visiting the island and taking the tortoises aboard as food, they became extinct. The Island is also called Barrington Island, named after British Admiral Samuel Barrington. Large numbers of Sea Lions can be found on the landing beach and Galapagos Hawks can also sometimes be seen. Day 8 San Cristobal Isl. Lobos Island is an islet about an hour away from San Cristobal. Blue-footed Boobies will nest here seasonally. In recent years Frigate birds have begun to nest here. Sea Lions are abundant, as well as Marine Iguanas. It is a very calm and tranquil site with beautiful views, including Kicker Rock off in the distance. You will be transferred to your the airport for your ongoing flight.